The R185 bio-shredder is a very compact machine and thanks to its versatility and the various available versions, it is suitable for both private and semi-professional users. Its cutting system is formed by 2 fix front blades and a counter-blade for a first shredding of the material and by 10 mobile back hammers for a further refining. A mobile screen, placed at the exit of the minced material, guarantees its fineness. The ejection blades placed behind the rotor facilitate the ejection of the material through a 270° rotary, 1700 mm high ejection pipe with adjustable throw depth. Thanks to this cutting system, it is possible to obtain a particularly fine material, suitable for heaters. 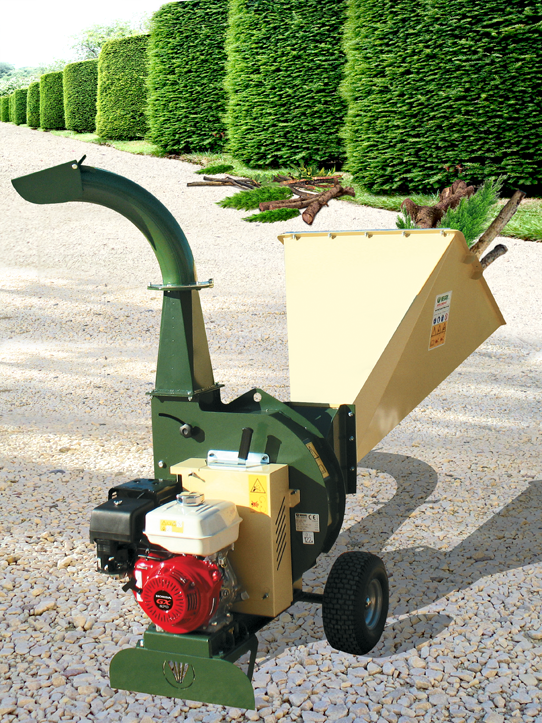 The machine can be supplied with or without hydraulic feeding roller; in the first case, the roller has adjustable speed and rotation direction and it automatically carries every kind of vegetable waste, even damp and fibrous woods such as palms and lindens, towards the cutting group (maximum diameter 90 mm). The bio-shredder is proposed with electric engine 380V, with petrol engine Honda or Subaru or in tractor version with three-point linkage for tractors. All versions with Honda GX390 with electric start have a special Nostress, which automatically regulates the feeding on the base of the shredding stress. The electric versions have a belt transmission, the petrol engine versions have a belt transmission with manual switch and the tractor versions have a gearbox and an elastic joint. Built in an easy and sturdy way, the R185 is easy to use and to move because of its perfect balance and its large-size pneumatic wheels. Thanks to the compact dimensions, the lifting hooks and the great handling, it is even easy to load the machine on little trucks or vans. This machine allows you to obtain shredded material of approximately 1 – 1,5 cm length ( 1 ) that then has to be refined, before being introduced into the P70 pellet mill ( 2 ).